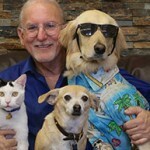 Joey Herrick is the President and founder of The Lucy Pet Foundation an animal charity based in Westlake Village, CA. The Mission of The Lucy Pet Foundation is to reduce pet overpopulation by funding mobile spay/neuter clinics across the country and to support causes that benefit animal welfare. “Lucy” is the name of a female Chihuahua mix that was rescued by the Herrick family. She was found wandering in the mountains; completely covered with dirt, toenails curling under, tire marks on her back and malnourished. A few weeks after she was rescued, she gave birth to five puppies. Lucy and her pups became the inspiration for The Lucy Pet Foundation. Today Lucy comes to the office regularly to check on her Foundation. Joey has a long record of supporting animals in need, with over 30 years of hands-on help. While Joey owned Natural Balance Pet Foods, he donated millions of pounds of food to animal rescue groups because it was his belief that they were the ones who were saving animal lives. He saw first hand how local rescue groups were going into the shelters, taking animals off death row and placing them into foster homes. After he sold Natural Balance in July 2013, he committed himself to do everything he could to help stop the 80,000 dogs and cats a week from being euthanized due to pet overpopulation. Since he started the Lucy Pet Foundation in 2013, Herrick has spent over $1.9M of his own money operating mobile spay and neuter trucks in Southern California to provide low or no-cost spay and neuter services. The reputation for the quality work that the Foundation does has been recognized by the City of Los Angeles. In January 2016, they awarded the Lucy Pet Foundation a multi-year, $500,000 per year contract to spay/neuter 10,000 animals over the next two years. The Lucy Pet Foundation is also the recipient of a $50,000 grant from the Petco Foundation to perform spay/neuters in local communities. 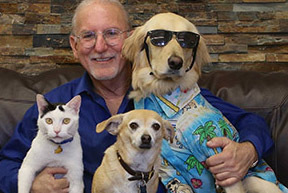 In order for Herrick to achieve his goal to lower euthanasia rates nationwide, he founded Lucy Pet Products, which develops innovative products for the pet specialty retail channel. Lucy Pet Products is committed to helping animals by donating to the Lucy Pet Foundation. 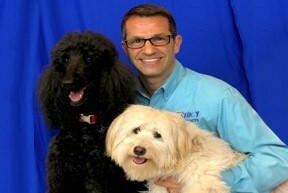 Rick Rockhill is Executive Vice President and Partner at Lucy Pet Products. Rick Rockhill is Chief Operating Officer and Partner at Lucy Pet Products. Rick has over 20 years of pet industry experience, including Pet Care Superstores, Petco, Natural Balance Pet Foods and Big Heart Pet Brands. His senior executive leadership includes merchandising, innovation, product development, sales, and marketing throughout North America, Europe, and Asia. Rick’s two decades in the pet specialty industry includes the deep expertise of nutrition and consumables products, including super-premium, natural dog and cat food. He led the development of the natural food category at a major pet specialty retailer in the US and set their standards for natural products. He frequently attends and participates in pet food nutrition educational conferences and has worked closely with the leading pet food manufacturing plants across the United States and the European Union. He frequently shares his pet industry expertise as a public speaker and conducts seminars to assist businesses and non-profit animal organizations worldwide. He presently serves on the Innovation Team at a major ingredient supplier to the pet industry. During the past four years, he has served on various Boards of Directors; The Lucy Pet Foundation, Zarhill Partners Group, and on the Advisory Board of a private pet industry manufacturing corporation. Rick is passionate about pets, animal advocacy, and philanthropy that makes a difference. He has more than a decade of experience with charitable fundraising through National Guide Dog Month, National Service Dog Month, and the Helping Heroes Campaigns, which collectively raised over $7 million. Rick’s personal interest and support for animal advocacy have included the Guide Dogs of the Desert, Animal Samaritans, and Actors & Others for Animals. Rick lives in Southern California with “Adele”, a Standard Poodle rescue, “Miss Ellie” a Labradoodle rescue, and “Sheldon” a Standard Poodle. 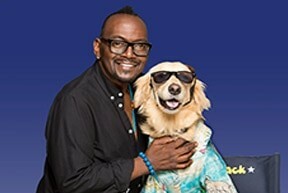 Randy Jackson became a partner at Lucy Pet because he was inspired by the Lucy Pet Foundation. 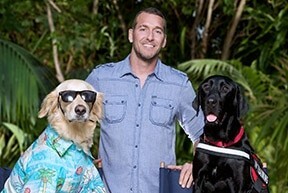 Brandon McMillan is a 3-time EMMY-AWARD® winning television series host of ‘Lucky Dog’ on CBS. Brandon is also a trainer to some of Hollywood’s top A-listers. Some of Brandon’s extensive list of private training clients include: Ellen DeGeneres, Andy Cohen James Caan, and Kate Hudson. Brandon has a training ranch where over a hundred dogs pass through every year. He has fed Lucy Pet Formulas for Life™ food to every one of them for over a year, and the dogs have thrived. “They love it and I love it because I know they are getting great nutrition. Good nutrition is a vital and very underrated element to a dog’s behavior and brain function while being trained. What’s also important to me is that the sales of these foods help support the Lucy Pet Foundation“, said McMillan. Betsy Martin, Director of Marketing and Product Development, for Lucy Pet Products. Betsy Martin has been working in the pet industry for almost 30 years. 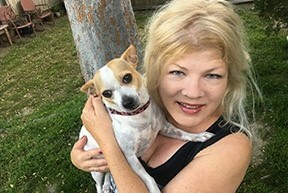 She has been involved with animal rescue since she was a child and has worked with The Lucy Pet Foundation since its inception. Betsy has 5 rescue dogs and many rescue cats, as well as a potbellied pig. For the past 17 years, Betsy has followed Joey Herrick through her career in the pet industry and is currently Director of marketing and product development with Lucy Pet Products. A core squad member of the Lucy Pet Foundation and, as a former rescue, and ambassador. Surfin’ Jack is a 3-year-old Golden Retriever/Saluki mix rescued from the Los Angeles East Valley Animal Shelter. She is the Spokesdog for the Lucy Pet Foundation and Chief Product Coordinator for Lucy Pet Products! A core squad member of the Lucy Pet Foundation and, as a former rescue herself, an ambassador for shelter pets everywhere! Jack is also a registered service dog. She gives the paw stamp of approval for all Lucy Pet Products. Surfin’ Jack’s fun-loving personality was the inspiration for her own Surfin’ Jack line of shampoo and leave-in conditioner for pups! In February 2015, Surfin’ Jack and Ricky starred in “The Lucy Bowl” TV commercial, which aired on Super Bowl Sunday and became one of the top 10 TV commercials of the year. Surfin’ Jack loves to surf, as well as traveling to stores and pet events, meeting pets and people! Have you seen Surfin’ Jack visiting some of our retailers or maybe a show? If you take a pic, make sure to tag us #lucypetproducts so we can feature your photo with Surfin’ Jack in our #fanphoto Fridays! 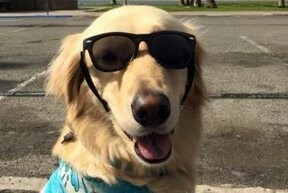 Watch for Surfin’ Jack on our National Tour with Lucy Pet’s Gnarly Crankin’ K-9 Wavemaker as we search for amazing surfing dogs! Ricky is the Feline Ambassador of Good Will to all who visit The Lucy Pet Foundation and Lucy Pet Products. Ricky the Rescue Cat is approximately 2 years old. 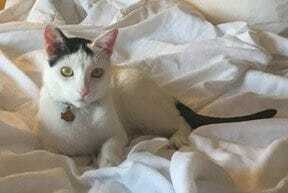 He was adopted from SEAACA Animal Shelter, Los Angeles, CA. Ricky is the Feline Ambassador of Good Will to all who visit The Lucy Pet Foundation and Lucy Pet Products. He is a highly discerning and hard working Spokescat of the Lucy Pet Foundation and does quality assurance for Lucy Pet Products! In February 2015, Surfin’ Jack and Ricky starred in “The Lucy Bowl” TV commercial, which aired on Super Bowl Sunday and became one of the top 10 TV commercials of the year. Ricky’s best pal is Ethel, who hangs with him on his off days at The Lucy Pet Foundation and he’s now teaching Little Ricky, the newest addition to his posse, how to walk on a leash. Ricky’s image is featured on Lucy Pet Products’ Cats Incredible™ Cat Litter bags. Ricky the Rescue Cat loves to high-five. Have you seen Ricky the Rescue Cat at a pet event or a show? If you take a pic, make sure to tag us #lucypetproducts! 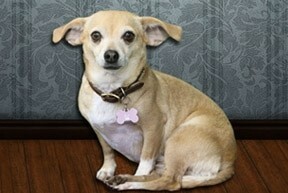 Lucy is a female Chihuahua mix who is also a core squad member of the Lucy Pet Foundation and, as a former rescue. Lucy is a female Chihuahua mix who been out on her own for a long time. She was found completely covered with dirt, toenails curling under, tire marks on her back and malnourished. A few weeks after she was adopted, she gave birth to a litter. Lucy and her pups became the inspiration for The Lucy Pet Foundation. Today Lucy lives with our founder Joey Herrick and his family. Her story also helped inspire our first product line of shampoos. Lucy is featured on the label of our “Berry Berry Smellicious” Shampoo and Leave-In Conditioning Spray, also on the front of our Formulas for Life ™ dog food bag. She set up “Lucy’s Taste Test Panel Pals” to get feedback from her canine and feline friends to help the human Product Development Team at Lucy Pet make great products that dogs and cats will love. Be the first to learn more about our new products.